If you keep tripping over your folded up ironing board you may want to consider a wall mounted version instead. There are many versions of these around, and their advantages are clear. You can merely fold down the board and begin your ironing, and then fold it back up when done instead of struggling to set up your board each time before you even begin to iron. In addition, mounting the board on the wall utilizes otherwise wasted space in your laundry room, or wherever else you plan to iron. I like this particular model because it is compact in size, which makes it useful if you want to do your ironing in a small space. 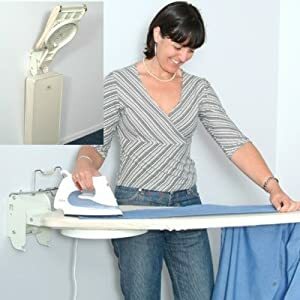 In addition, once it is folded out you can actually swivel it and lock it in many different angles, so that you can iron however works best for you. Finally, this model, when folded up, only sticks out four inches from the wall, meaning you are less likely to run into it like some models that stick out further from the wall.